As someone who used to be very nearsighted, rarely looking far ahead and to my sides hardly at all, the “wide open spaces” of my enhanced peripheral awareness now are a joy. I’m no longer trapped by that tight restrictive cage which eyeglasses trained me to stay within. Don’t look outside the frames! Don’t color outside the lines! When I was wearing -10 contact lenses, a co-worker regularly teased me about seeing me driving and waving to me, yet I never noticed him in the next car! I did not have good visual habits back then, with my attention only focused on the small bubble around me. Even though I had no eyeglasses frames on my face to artificially restrict my vision, the way I used my eyes was restricted. Now when I drive, I can see farther to the sides naturally, without straining. This is a delight, as there’s so much to see. I’m sure I’m a safer driver than when I was only focused on the car immediately ahead of me. Glasses train us to overuse our central vision, and to ignore our periphery. In healthy natural vision, the clearest point of sight is in the pinpoint center of the visual field, from light falling on the macula of the eye in the center of the retina. The healthy eye is in constant motion, re-directing the sharpest vision to a different area. Wearing glasses teaches our visual system to artificially expand the center, trying to see everything clearly at once, without moving the gaze from point to point to point. I’ve wondered if this bad habit is behind macular degeneration, where the central vision is so overused it starts to wear out. 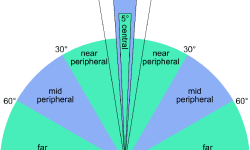 One of my vision teachers said that 5% of healthy vision should be from the central macular area, and 95% from the periphery. This 95% is clearer near the center (though not as crystal clear as macular vision) and less clear farther away from the center. He said many people with poor vision have this reversed, over-using their central vision and shutting out their periphery entirely, giving themselves “tunnel vision”. This was certainly my case until about 10 years ago. If your gaze and your head are not slightly moving all the time to look at something new, my guess is you have a stiff neck. This is classic for people with poor vision. Healthy human vision is supposed to work by the clearest image falling in the center of the retina (the macula), then the gaze easily moving to something interesting in the periphery, to let the sharpest vision examine that next. Even if it’s nearby, a slight gentle movement of the head will accompany the eye movement. As I continue to improve my own sight, peripheral awareness has become a barometer to me of how good my vision is. Good vision is not only about how well I can see the eye chart! I’ve noticed my periphery contracts when I get anxious, and I go into that tunnel vision mode. I guess this intense focus is a good thing if I’m in a fight for my survival, when I want no distractions. In my daily life, it’s not necessary. I’ve said many times that for me, limited vision comes from high anxiety and not feeling safe. I can feed this pattern by ignoring my periphery and trying and straining to see everything clearly, so nothing will “get me”. Or I can take a few deep breaths, feel my feet on the ground, and let my peripheral awareness open up. The expansive view is more relaxing to me, with more possibilities. And this feels so much better! Tom, hi and thanks for your thoughts. First, WordPress gets the credit for the blog articles listed below the main one, not me. 🙂 I think they look for similar words to those in the main article title, or some algorithm like that. In any case, I’m so glad it’s helpful! Second, the caution against eye exercises needs some clarification. Everyone is different, and some folks can strain *more* when doing eye exercises, and of course this won’t help at all! Also, people can do them “blindly” (ouch! ), just going through the motions while their mind is somewhere else, which will give them limited benefit. This article may shed a bit more light: https://www.iblindness.org/3672/why-dont-vision-exercises-work-for-me/. And this one too: https://www.iblindness.org/4391/vision-practice-all-day-long-2/. If the eye stretches highlighted some soreness for you, good! This is something which needed to be addressed. Here’s an older article on astigmatism which might help too, if you haven’t seen it (in case you don’t have enough to read already 🙂 ): https://www.iblindness.org/1051/yes-but-i-have-astigmatism/. Keep up the good work, Tom. I’m cheering you on! Oh, Tom, I’m so sorry about your Dad. Loss of a parent is a huge deal at any age. Give yourself plenty of self-care, and all the time you need to heal from this. Too many people rush the grieving process, in my opinion . And yes, as I’ve said I consider peripheral awareness crucial to good vision, and it’s a lot easier to notice this out-of-doors where your periphery can expand and expand. Thank you for kindness regarding my Dad’s passing. The world looks a little different now, but it’s all “Lessons” and I’m probably a better, stronger person as a result. Since encountering this Vision Walks concept, my walks are FAR more enjoyable and I notice my vision seems improved and more relaxed on the walk back home. THANKS! Tom, thanks for letting me know about your vision walks being more expansive — I love this! Yes, vision improvement is not rocket science. Good work! Thanks, Tom. This touched me, and made me smile. The best teachers I’ve encountered are always learning. I think you need to be a good student to be a good teacher. If I can’t teach it effectively to someone else, to me that means I don’t really understand it! 🙂 Take care. Previous Previous post: Are Your Eyes Happy? Next Next post: Remember Clear Sight?